Update: The City of Lancaster will join the worldwide crosswalk art movement on Monday, January 28, when it will begin the installation of a series of murals by The Art of Chase. The intersection of Lancaster Blvd. and Ehrlich Avenue will be closed to street traffic daily, from 7:30 a.m. – 3 p.m. for this unique event. The City encourages residents to come out to see the artist in action from 8 a.m. – 1 p.m. each day, until the installation is complete. Based on current weather forecasts, the project is estimated to conclude on Wednesday, January 30. Lane closures on Avenue K between 32nd and 40th Street West due to sidewalk, curb, and gutter repairs (Public Work Construction Project PWCP 18-006). 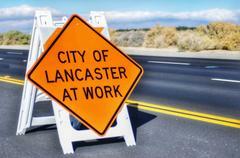 Construction activity near Lancaster City Hall at the intersection of Kettering and Fern Avenue. Scope of work includes new bulb outs and pedestrian ramps (PWCP 17-020).